In DC, I found room to breathe. Eleven years in, my relationship with the city is still fresh–full of opportunities, unmet friends, unexplored places. It’s easy to find a quaint street I’ve not roamed, a café I’ve never tried, a fun meetup, an unusual festival, another shop selling specialty cupcakes. I believe that if you’re bored in DC, it’s your own fault. New adventures are there for the taking. And it’s the depth of those possibilities that I love. DC’s residents have varied backgrounds, too, which brings openness. People here were born in other countries, they’ve traveled around the world, they speak multiple languages. They have interesting jobs and different perspectives on life. This city isn’t made up of a majority, of one type of person; it’s a collection of many people, sharing many viewpoints. The ethnic diversity is the best. I love the exotic accents, the traditional dress, the savory food, and most of all the stories of faraway places that are a regular part of life in the city. Abundant museum exhibits add even more access to other cultures. 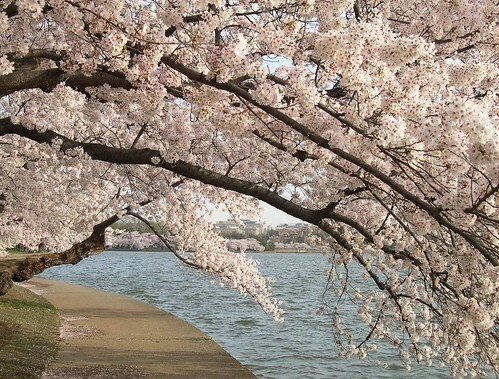 Spending a day in DC can be like taking a trip to another country, without ever leaving home. Being an outdoorsy type, I love DC’s closeness to the mountains and the shore, and the green spaces within the Beltway. The running and biking trails stretch for miles, and some feel like they’re far outside city limits. I love seeing the wild turkey on Roosevelt Island. The Potomac has its own allure. At sunset on summer nights, I love to walk across the Key Bridge and look west, to the subtle curve of the river, where the soft warm air lays a pink mist over the water, trees, and sky. On sunny days in winter, I love how the sycamore trees on the river’s banks stand out, their delicate white branches reaching out to clear blue skies. And I love to see the Capitol and the monuments lit up at night. Many years ago, I read an article by a woman who had just moved away from DC. In it, she described the sadness of seeing in her car’s rearview mirror the red blinking of the Washington monument, bidding her farewell. They’ve oriented me when I’ve glimpsed them from a once-unfamiliar stretch of highway, on the way back from a family holiday trip to the Eastern Shore. They’ve towered above me as I’ve gone downtown to meet friends for dinner, to go ice skating, or to hear jazz at the Sculpture Garden. Some day, I imagine I will leave for points west, where the tall, pointy things that scratch the sky are mountains. And I doubtless will carry in my mind an image of the Washington monument, watching over a city full of life, and life experiences waiting to be had. It’s for them—those memories and endless possibilities—that I love DC. I loved it. I am moving to DC near the end of April and I can not wait. I’m moving from a pretty suburban area and am so excited for all of the possibilities that await. I love exploring new shops and restaurants and cafes. I also love how dog friendly this town is. It took nearly 3 years for me to get there, but I must agree “if you’re bored in DC, it’s your own fault”. I never want to pay admission to a museum again! Lovely is understatement. You capture the essence of D.C. beautifully. Keep it coming! Donna – poetic as always. We moved here in 2005 and have never looked back. Each time we are on the Mall, I look east to the Capitol and west to the Washington Monument and stand in wonder of what DC represents. Donna! I’m sitting delayed in the Birmingham Airport and cannot WAIT to get home and see the blinking red lights. Truly, great post. Makes me homesick. Well put. I hear many people who come here and do nothing but complain about how crowded it is, or the crime, or the weather. But it’s much better to focus on the history, traditions, cultures, adventures, monuments, landscapes, museums, and more. So many things to do in this area … I’ll never get to them all! Welcome, Athena Marie, and welcome home, Katie–and thanks so much to everyone for your kind words and for sharing your thoughts! I’m with you Donna. As a brand new resident of the area (Virginia for now) and otherwise a California native, I’m completely gaga over my new home. I love the activity and energy of DC, and the raw beauty of the terrain surrounding it.